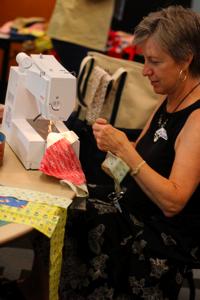 A beautiful thing happened last Tuesday night when more than two dozen women gathered before a pile of donated fabric for the first meeting of a new community quilt bee. 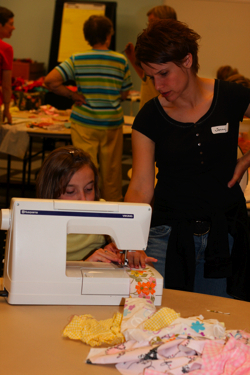 As you may recall, I accepted the fabric on behalf of the Craft Club I organize at the YMCA in Grand Rapids. 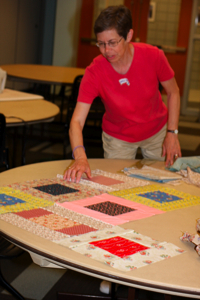 The donor was Mary Dunneback, an 82-year-old woman looking to retire from quilting and get her fabric into the hands of someone who would not let it go to waste. Well, I think Mary will be pleased with the work of this group because I think we’re on to something. We introduced ourselves, got inspired and then we got to work. As the conversations started between rookies and veterans we began to form a community. It’s too soon to tell where it all will lead, but I have a good feeling about this. See don’t we look like an inspired bunch. 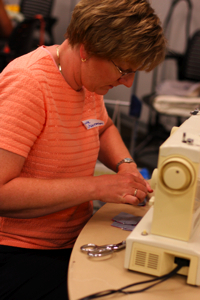 Some arrived with irons and sewing machines and years of experience. Others came as they were, with a desire to learn. Everyone was welcome. 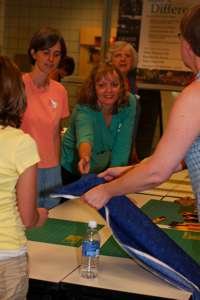 The bottom line in that we all showed up to be part of a community craft experience. There was a lot of talent in the room which I believe will lead us to explore some wonderful possibilities. 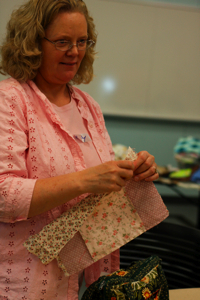 Carol Peters told the group about the quilt charity, Margaret’s Hope Chest, that her daughter, Carin Vogelzang, started in honor of Peters’ mother who suffered a fatal head injury when she tried to fight off two women trying to steal her purse. Margaret Herrema died two days later. She was 81. 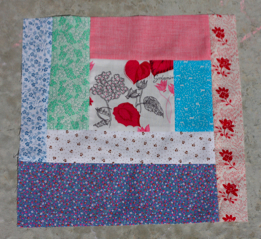 Instead of letting their hearts grow bitter after losing a loved one to a senseless crime, they decided to start quilting for others experiencing tough times in the spirit of Margaret Herrema, who crafted for charity throughout her life. (I’ll be sharing more details of their story here in a future post.) It was great to have Carol in attendance and we look forward to getting some quilts out to good homes through Margaret’s Hope Chest. The first meeting was largely organizational in nature, but we we did get some sewing done with a couple groups taking an assembly-line approach to kick-start production. Mary, Carol and Betty worked fast, completing 14 blocks before it was time to go home. Great job, ladies! 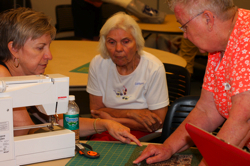 While the veterans did their thing, long-arm quilter, Terri Watson, and quilting instructor, Betsy Carlson, showed the newbies how to use rotary cutters. Terri and Betsy also showed up early to organize the fabric stash before the masses arrived. Thank you, ladies! 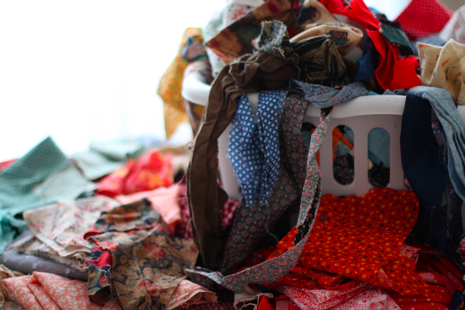 Also, a special thanks to Mary and everyone who donated fabric to our growing stash, the YMCA for giving me space to host these craft gatherings and Lakeshore Sewing for donating two rolls of batting and offering discount coupons to those in attendance. I really appreciate all the support we received for this project. 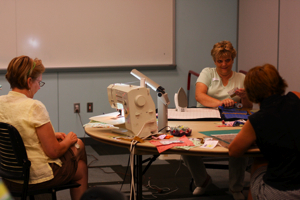 I’ll have the fabric with me at our regular Craft Club meeting at 6:30 p.m. Tuesday at the David D. Hunting YMCA in Grand Rapids, Mich. (Craft Club meets on the second and fourth Tuesday of the month.) I hope to see all of you there! I’m working on getting a Saturday bee scheduled soon. Check back for updates on that. Send me an e-mail if you’d like to be added to the bee mailing list.